Jose Maria Olazabal paid tribute to Seve Ballesteros after guiding Europe to a 14½-13½ victory over the United States in the Ryder Cup at Medinah. The European team captain formed the most successful Ryder Cup partnership in history with his fellow Spaniard Ballesteros, who died in May 2011. 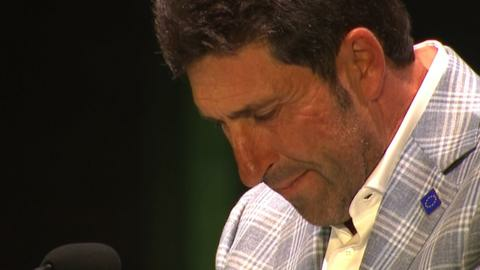 "Our team played in the spirit of Seve without ever giving up," said Olazabal. "You believed and you delivered and I'm proud that you have kept Europe's hand on this Ryder Cup." Olazabal and Ballesteros won 12 points from 15 matches as a pair and the victorious captain added: "Seve will always be present with this team and he was a big factor for this event. "The boys understood that believing was the most important thing and they did. To the 12 men of Europe, what you did out there was outstanding. "All men die but not all men live and you made me feel alive again this week." The Europeans wore navy blue jumpers and white shirts with a silhouette of Ballesteros on the sleeve, the colours most associated with five-time major winner, in tribute to the man who breathed new life into the Ryder Cup after the Great Britain & Ireland team was expanded to include European players in 1979. Ballesteros played in the biennial contest eight times and captained the side to victory in 1997 on home soil. Europe won a record eight-and-a-half points out of the 12 available in Sunday's singles matches and Sergio Garcia, who beat Jim Furyk by one hole, attributed his win to his Spanish compatriot, who died after a long battle with a brain tumour. "I have no doubt in my mind that he was with me all day because there's no chance I would have won my match if he wasn't there," said Garcia. "It was amazing and it feels so good to be able to win it for him and for our captain, Jose; it's been amazing." Justin Rose, who came from one down on the 16th to birdie the last two holes and beat Phil Mickelson on the 18th, added: "In the moment you've got to do what you've got to do, but as soon as I holed that putt [on the 18th], as soon as I came off the green, my first thought has been to Seve. "I had a glance down and looked at my left sleeve and that's the kind of stuff he would have done. "He's been an inspiration for this team all week long." Ian Poulter beat Webb Simpson 2up to complete four wins out of four at Medinah and take his Ryder Cup tally to 12 victories in 15 matches. "This was a team performance and the team have done an unbelievable job," said Poulter, one of Olazabal's two wildcards. "There was a buzz in the team room last night that didn't feel like we had a four-point deficit. "For some reason, everyone was calm. Everyone was cracking jokes. We just felt we had that tiny little chance and the boys have proved it today and made history. It has been unbelievable. "My captain picked me to come and play and I owe it to him, and Seve, to be here today. It's pretty special." The Ryder Cup returns from 26 to 28 September 2014 at Gleneagles.